The Central region of Georgia encompasses 25 counties, from Morgan to Irwin and Macon to Montgomery, and all across the territory things have been and are moving in a positive direction, much of it transportation-related. Baldwin County’s Triumph Aerostructures-Vought Aircraft Division added 20,000 square feet, and “is constantly growing its internal structure,” according to Matt Poyner, executive director of the Development Authority of the City of Milledgeville and Baldwin County. Chemtex, a manufacturer of environmental clean-up materials, brought 80 jobs to the county last year, and Japanese company Strapack will start manufacturing plastic strapping this month, bringing in an initial 10 new jobs and representing a $4 million to $6 million investment. Chemical company Zschwimmer & Schwarz is opening a second 46,000-square-foot facility in Wilkinson County, representing a $15-million investment that will add 25 jobs. Last March, Baldwin and Wilkinson counties’ Fall Line Regional Development Authority purchased 475 acres at the junction of the Fall Line Freeway and U.S. 441 and will market it jointly. In Putnam County, biotech firm Aalto Scientific, a supplier for the medical diagnostics industry that relocated from California in 2014, has acquired a third building for its operations and increased its employees from 80 to 87. Mobile home manufacturer Legacy Housing recently moved into a former Horton Homes facility – once the largest employer in the county – starting with 75 workers, according to Putnam Development Authority Executive Director Terry Schwindler. The company expects that number to increase to 200 by the end of this year with a potential second manufacturing line in 2017. Elsewhere, a dialysis center will begin operation, preventing local residents from having to drive long distances for that life-saving service. “We had a good year last year, but nothing like we expect in 2016,” says Dublin-Laurens County Development Authority President Brad Lofton. Latvia-based Valmiera Glass Group, a fiberglass manufacturer, is expanding its U.S. headquarters in Dublin, an overall $90-million investment through 2022 that will add 425 jobs. It’s one of the biggest economic events in Laurens County in probably 20 years, according to Lofton, and will make the company the county’s largest private employer. 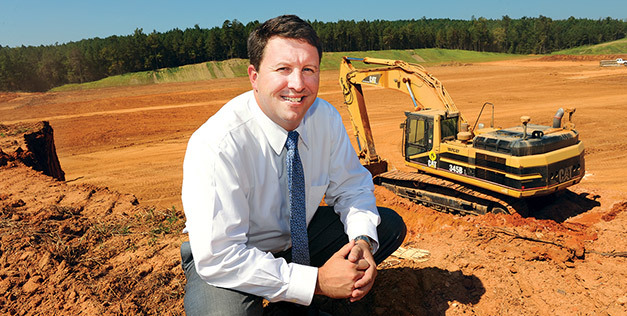 Laurens County has the first certified industrial Mega Site/Super Park in Georgia, says Lofton. The 2,000-acre industrial site has 5,000 feet of rail service and is located on Interstate 16. In the non-industrial sector, Dublin’s Carl Vinson VA Medical Center is recruiting 60 new physicians. Downtown, a historic 1913 bank building was renovated as the new Dublin campus for the Georgia Military College. In Dooly County, a new Ensyn Biofuels facility, a first of its kind in the U.S., could provide a new revenue source for farmers and pine tree growers. The facility will take pine limbs and treetops left from timber harvesting and convert them into heating oil, says Dooly County Economic Development Council Director Bob Jeter. The $100-million investment will bring 138 jobs, including high-earning chemists and engineers at an on-site laboratory. Added to that is a $100-million expansion of the existing Tyson Foods processing plant projected to add more than 500 jobs. Jeter expects the two projects will increase demand for housing in the county, resulting in jobs in construction and ensuing retail. For Bibb County, the rubber is hitting the road with Korean tire-maker Kumho. The company revved up in January with an initial 300 employees. The $424-million facility is the company’s first in the U.S., according to Macon Economic Development Commission (MEDC) Senior Vice President Pat Topping, with a targeted 450 jobs at full capacity. In another high-flying Macon-Bibb project, Boeing is converting its former military plant to production of fuselages for 747 passenger jets, says Topping, who sees this as a chance to gain additional work from Boeing. The $81.7-million investment will create about 200 jobs. The commission also helped four companies locate or expand, bringing an additional 360 jobs and close to $200 million in investment. Macon’s Middle Georgia Regional Airport has a direct impact of $198.5 million, Topping says, and five projects have either decided or are on the verge of a decision to locate there, including Yulista, an Alaska-based company dealing in maintenance and modification of industrial and military aircraft that expects next year to create more than 80 jobs. In September, Ben Hill County welcomed Fitzgerald native Jason Dunn as executive director of the Fitzgerald-Ben Hill County Development Authority. In January, wood processing and manufacturing company Choice Wood Inc. started operations in the former Hurricane Cargo location with plans to hire up to 50. Also early this year, GBW Railcar Service is undergoing a $9-million expansion to create “the largest and most technologically advanced site of their 34 locations,” according to Dunn. Additionally, Southern Veneer Products, a regional forestry industry leader, expanded to the tune of $9 million. “2016 holds the promise of being a year that the community can build on its strengths and current resources,” Dunn says. One highlight for Houston County last year was the announcement that Sandler AG, a 135-year-old family-owned German unwoven fiber supplier, is opening its first American plant in Perry, a $30-million investment that will bring 140 jobs. Additionally, says Houston County Development Authority Executive Director Angie Gheesling, existing industry did very well, with 60 percent announcing expansions. Including Sandler AG, the year’s total in investment was $200 million and 200 jobs. New business and expansions are the economic headliners in Irwin County. Ocilla-Irwin Industrial Authority Chairman Joey Whitley reports that Rockport, a division of Forest River Industries, moved into a previously closed plant, investing $5 million and bringing 40 new jobs to make bodies for one-ton trucks. Irwin County’s oldest manufacturer, Irwin Manufacturing Corp., invested $250,000 to add a product line of pet blankets, bringing on 10 new employees. For 2016, the county is also working with a new prospect, a technology company, Whitley says. Judy Sherling, executive director of the Development Authority of Jeffersonville and Twiggs County, reports the current phase of four-laning State Highway 96 is scheduled for completion in August, and retail development at its I-16 junction is anticipated. A closed hotel at the interchange has reopened under new ownership and management. The 20 MW solar farm Richland Solar Center is now operational. Twiggs County has also started the Georgia Ready for Accelerated Development (GRAD) certification process for a 53.7-acre site and hopes to complete that this year. In Jasper County, Development Authority Director David Dyer reports it was an exciting year with the completion of Norton Packaging’s Monticello plant and the hiring of 52 workers. The company plans an expansion in 2016 with an additional 40 employees and doubling its production of food-grade containers to 1 million monthly. Elsewhere, Dexter Axle, maker of trailer axles and running gear components, increased production capacity and number of jobs to 64, while Oldcastle Lawn & Garden upped production and inventory capacity, growing to 30 workers. The economic climate is blooming in Peach County. Development Authority of Peach County Project Manager Jill Bowen says American Tire Distributors and Valley Industrial Products are expanding and adding employees. Also, classes have started at the new Peach County Workforce Development Center, the culmination of a decade of planning and preparations. Peach County increased its Freeport exemption status – an exemption on state property taxes for business inventory – to a full 100 percent, and the development authority is working to revitalize its smaller Fort Valley industrial park. Local government agencies and Flint EMC partnered in 2015 to form the I-75 Corridor Council for supporting development of land along I-75 in Peach and Houston counties. “The communities recognize the regional asset and continue to meet on a regular basis to execute a strategy for success,” Bowen says.